In 1066 Spofforth had belonged to Gamelar, but by the date of the Domesday Survey it had been granted by William the Conqueror to William de Percy. It was the Percy family, who owned nearby Spofforth Castle, who were the first known patrons of the Church and the patronage remained in their hands until 1670. The oldest parts of the existing church are Transitional Norman, although it is likely that the foundation was earlier. The church was extended and modified in the 15th Century. The present church is largely the result of a rebuild in 1854/5 which returned the nave and chancel to Norman style, which reflected the style of the Norman arcades. The enlargements of the 15th Century may have been thought no longer appropriate once a new church had been built in Wetherby. An unpopular aspect of the reconstruction was the shortening of the chapel by 24 feet. The floor of the original chancel can still be seen beyond the east end of the church. The 15th Century tower remains intact and contains four bells, three of which date from the late 16th/early 17th Century. The list of Rectors recorded in the church starts with H.D. Evesham (1280-1289). Notable Rectors include Matthew Hutton (1729-1743) who went on to be Archbishop of Canterbury and James Tripp (1847-1879) who built Spofforth School, Follifoot Church and School, Linton School, opened Little Ribston Church and rebuilt Spofforth Church. 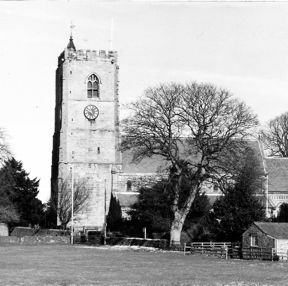 In 1971 the parish was united with the neighbouring parish of All Saints', Kirk Deighton.